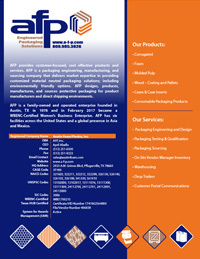 AFP, Inc. provides customer-focused, cost effective products and services. AFP is a packaging engineering, manufacturing, and sourcing company that delivers market expertise in providing customized material neutral packaging solutions; including environmentally friendly options. AFP designs, produces, manufactures, and sources protective packaging for product manufacturers in retail and direct shipping environments. AFP has six facilities across the United States and a global presence in Asia and Mexico. We have manufacturing locations in Austin TX, Dallas TX, El Paso TX, Nashville TN, Springfield MO and Columbus OH. Through our logistics model, network of partners and affiliates we have the capabilities to service most locations on North America, including Mexico. We serve many major manufacturing regions in China, Taiwan and have the capability to serve Malaysia and other geographies through our affiliates and strategic alliances.